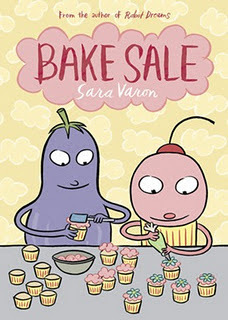 My first book of 2012 was a graphic novel called "Bake Sale" by Sara Varon, who also wrote "Robot Dreams". I don't usually read graphic novels, but I loved this book. Cupcake has it all it seems - his own bake shop, his friend eggplant, and a spot as a drummer in a band. One day having lunch, he discovers that eggplant's aunt knows his idol "Turkish Delight", and the two begin to plan a trip to Turkey. Cupcake makes decisions based on his desire to meet "Turkish Delight" and life begins to change. Both this book, and Robot Dreams have themes of friendship - maybe that is why I enjoyed them both. Being a baker myself, I loved the recipes at the end of "Bake Sale" and hope to make them in the future. If you want to find out more about author Sara Varon, check out her website at http://www.chickenopolis.com/. Happy New Year - hope you enjoy LOTS of great books in 2012! LOL, this sounds really cute and clever. I'm totally not a graphic novel girl, but I've heard a lot of rave reviews about this one. The cover is awesome!